In the spring of 2017, I took a course here at UC Davis titled Race and Ethnicity in Latin America. That same quarter, I also took a seminar about jazz music. While the two didn’t overlap much in the classroom (the seminar was focused on North American jazz from the 1950s), I soon discovered that the classes complemented each other beautifully in another setting altogether: the Robert and Margrit Mondavi Center. The key realization happened in April of that year when I attended a performance by Etienne Charles and his band in the Vanderhoef Studio Theatre. The sheer energy and skill of the musicians’ playing was enough to leave a lasting impression, but it was the cultural richness of their music that really stuck with me. 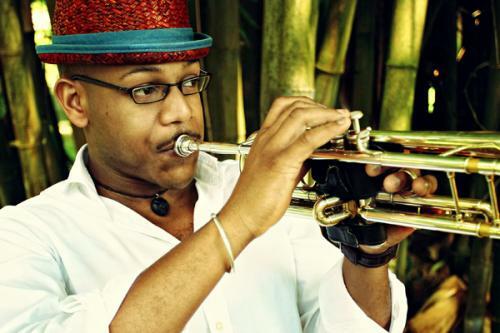 Charles, a trumpeter who was born on the island of Trinidad and educated at the Julliard School in New York, plays and composes contemporary jazz music that is immersed in the Afro-Caribbean musical tradition. His show that night was a delightful mix of styles and cultural influences: French Haitian Creole, Trinidadian calypso, New Orleans Dixieland, Jamaican reggae, and funk, to name just those genres with which I am familiar. As I was then learning in class, this diverse combination of peoples and traditions from different regions is not exclusive to Charles’s brand of jazz, or even to jazz more generally; it is a theme repeated again and again throughout the history of the Americas. Take the word “creole,” for instance. Often defined as a person of mixed European and African descent, it also applies to cultures, languages, or religions that are a syncretic outgrowth of such a mixture. In Charles’s deft hands, the word becomes a metaphor for something much wider, celebrating (but never glorifying) the New World as a point of contact with virtually unlimited creative possibilities—possibilities that persisted despite, or perhaps because of, a colonial past of slavery, racism, and genocide. If Charles’s work is any indication, this Pan-American creative wellspring is far from dry. His 2013 album, Creole Soul, weaves together musical threads as diverse as Thelonious Monk and Bob Marley, and his 2016 release, San Jose Suite, pays tribute to the people of three cities currently or formerly named San Jose (in California, Costa Rica, and Trinidad). I am certain that without my class on Latin American racial dynamics, I would have been unable to appreciate the full implications of projects like these; similarly, without my seminar about 1950s jazz, I couldn’t have put Charles’s boundary-pushing music in its proper context. But without the experience of that live performance in April 2017, my academic perspective on the music would’ve remained just that—academic. The Mondavi Center made it personal. Nearly every act I’ve seen at the Center since the start of my freshman year has been intellectually stimulating. Many have introduced me to musicians I will follow for years to come, such as Cuban pianist Harold López-Nussa or Jazz at Lincoln Center Orchestra bassist Carlos Henriquez. No matter the style or presentation format, all of the performers I’ve seen here have taught me something unique about the place or musical tradition that they come from, whether it’s a rooftop in Mali (as in the case of Ballaké Sissoko) or a neighborhood in Miami (as in the title of one of López-Nussa’s songs). All of them have become an integral part of my college education. If this cross-talk between academics and the arts isn’t something you typically expect from a research university like UC Davis, that only makes it all the more special. After all, how many university campuses—and how many university students, for that matter—are lucky enough to have a place like the Mondavi Center only a short bike ride away?